How complete are our streets? Do they put people first? What tools do we have to do this? Last month, Skye Duncan of National Association of City Transportation Officials (NACTO), Gil Penalosa of 8 80 Cities and Shin-Pei Tsay of Gehl Institute addressed these questions and more at “The Future of Complete Streets”, a public talk organised by Sidewalk Toronto. Through their presentations and discussions, moderated by writer Philip Preville, the panelists made a passionate plea for the human-centred design of our streets. According to Skye (and we have to agree), streets are not just spaces to move along but are also where we make money, spend money, dine, celebrate, relax, where our kids play and learn to ride their bicycles. But if you look at our streets, it is evident that we have forgotten these human aspects and have designed them like highways and speedways – in other words, to suit the needs of cars. Citing NACTO’s newly released Global Street Design Guide, Skye explained how we have to prioritise our streets for people on foot and sustainable modes like bicycles and transit instead of cars. To balance out all modes of transportation, it is important to move to multimodal Complete Streets where the needs of pedestrians, people on bicycles, and transit riders are prioritised – therefore, serving more than twice the number of people as in a car-oriented street but with lesser space. However, as Gil pointed out, one should remember that it is not enough to simply take care of all the modes of transportation but it is equally important to take care of our most vulnerable users. If we prioritize the needs of the 8 year olds and the 80 year olds, then we will make streets great for everyone. To change our perspective of how streets are used, and how they should be designed, we need a fresh set of eyes. According to Shin-Pei, data gives you that fresh set of eyes. For a project done at Times Square, though the area had 89% road space and only 11% pedestrian space, data showed that 90% of people using that space moved by foot. Insights like these helped the Department of Transportation make the political case for pedestrianising Times Square. Shin-Pei also shared with the audience the Public Life Data Protocol, an initiative by Gehl Institute through which public life data collected by agencies worldwide can be standardised and shared. Skye mentioned Shared Streets, NACTO’s platform with Open Transport Partnership where data is aggregated and anonymised and then used for the public good. In response to a question from the audience about how to translate global data and examples to the local context, Skye suggested checking out the street transformations in the NACTO guide. There are also many excellent examples of Complete Streets closer to home on TCAT’s Complete Streets for Canada website, including before and after evidence of Complete Street transformations that are happening here in Canada. A successful Complete Street is a collaborative effort between different public departments. Shin-Pei Tsay, in her presentation, observed how although walking through a street is a singular experience, it is actually decisions by many different departments (e.g. Planning, Parks and Recreation, Transportation). Citing numerous examples around the world, Skye remarked how transformations don’t happen by accident but by conscious decisions. Human-centred design requires people to be the starting point. 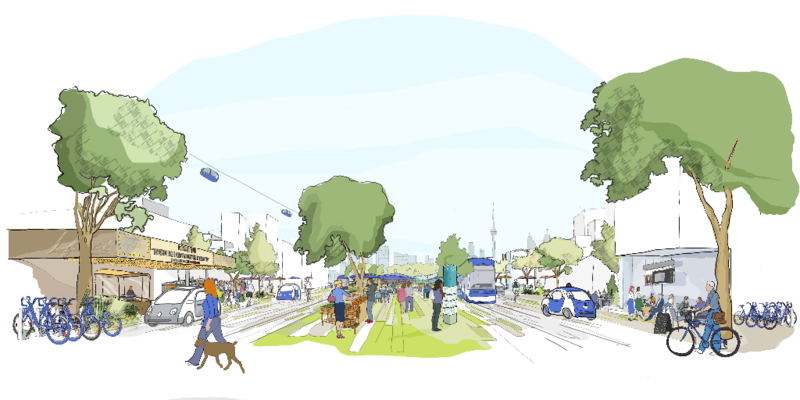 Sidewalk Labs promises that the proposed Quayside development on Toronto’s waterfront will be a complete community created through a collaborative, people-first process. TCAT’s Director, Nancy Smith Lea, has been invited to sit on Sidewalk Toronto’s Mobility Advisory Group. She will be pushing for true Complete Streets designs that are human-centered and prioritize safe, convenient walking and cycling.